Dr. Shapiro served as an instructor of psychology and career and educational counselor at RCC in the 1970s. In 2008 she was elected Person of the Year by the RCC Foundation. She was an associate dean at Pace University and later a professor and dean at City University of New York. 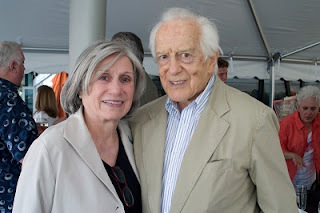 From 1992 to 2000, she served as Director of Adult Education at Rockland BOCES. Dr. Shapiro was dedicated to a multitude of civic causes in Rockland and received many honors and awards for her community devotion. She earned a BA in psychology and an MA in education from New York University, an MS in counseling from Long Island University, and her EdD from Columbia University Teacher’s College. She is survived by her husband of 66 years, Milton; her daughter Susan Hito Shapiro; her son-in-law Santi Hitorangi; and her grandchildren, Rio and Anamaeha Hito-Shapiro. A bench and plaque were installed in the College’s 9/11 Memorial Garden in Dr. Shapiro’s memory. 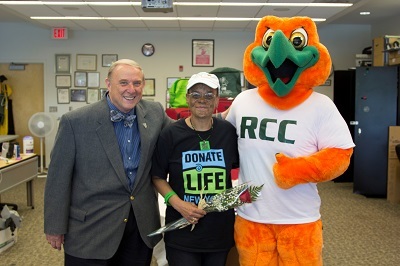 RCC celebrates alumna Roxanne Watson from Spring Valley, one of six winners preparing for an August trip to Fiji and the opportunity to fulfill their dream. Selected through an international competition that garnered more than 10,000 votes divided among 60 contestants, Roxanne, the sole American winner, hopes to create an international foundation to educate people about the gift of life-saving organ donations and named to honor the young man, Mike Bovill, whose heart she carries since her transplant operation in 2010. Roxanne has dedicated her “second life,” to educating people about the value of sharing the gift of life and has personally signed up more than 7,800 potential donors. After contacting Oprah Winfrey, Roxanne was invited to appear on her show and received another gift, meeting the family of Michael Bovill and they remain closely connected as the family cheers her on this mission. Currently enrolled in the Culinary Arts program, Roxanne previously earned an AA Liberal Arts: Humanities and Social Sciences in 1987. She has received numerous awards for her work including one received from President Obama through the 2014 L’Oréal Women of Worth contest.